So recently I just bought two new batteries. 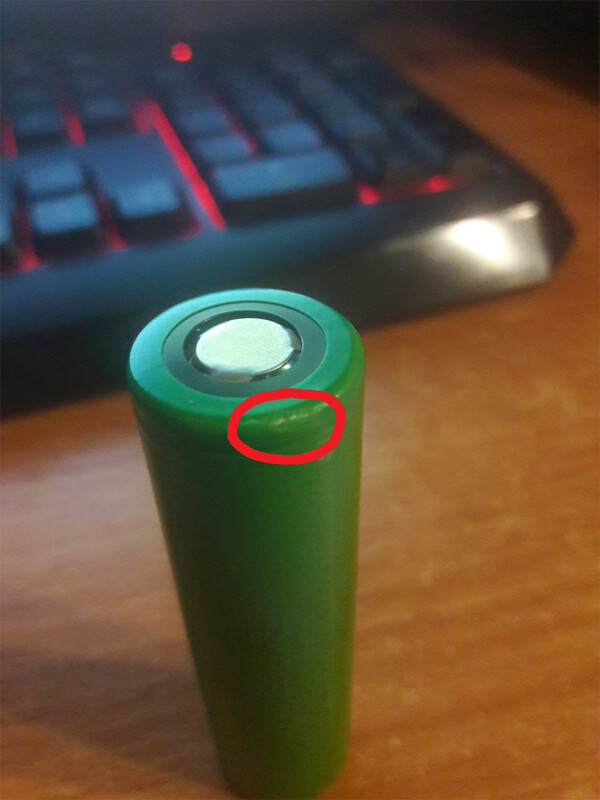 When I took it from the package I accidentaly dropped one of the batteries on the ground and a little scratch appeared near positive pole. It's actually pretty small scratch and i don't know if you can see it in the picture. What should I do? Is there a posibility to cause a short? There should be no problem using that battery if you have a compatible socket and you make sure no metal touches that area. How far did you drop it and how hard was the surface? That can be fatal. They usually self-discharge and lose capacity quicker from this but not necessarily get too hot. e.g. A drop from 1m with a compression stop of 0.1mm is equivalent to 10,000 g's from the ratio of drop to stop distance measured by it's compression unless it compressed more and flexed back. Then guessing maybe 1m/1mm= 1,000 g.
I proved this formula with accelerometers in the 80's when Operating Systems which were distributed on 5.25" hard disk cartridges from 30cm and there was no visible scratch. Yet it was enough to offset the disk and fail to recover data. Yet the fragility of any object depends on the g vs t fragility boundary curve which is not provided to customers. I resolved the problem with a better sleeve at Syquest. Batteries have similar small tolerances between edge conductors and this dent is near the edge of the cylinder. So I would expect degradation but not a safety risk. Why using short traces with the MCP73831 LiPo charger? Is it possible for batteries to give a false reading of being charged with a multimeter? Battery pack a little bit damaged. Should I throw it out or repair? Using a multimeter, can I tell if a lithium-ion battery pack is brand-new?